The Good Life Farm Co is an ethical farm owned by passionate sustainable farmers Claire and Paul Fogarty-Moore. Based in Victoria's beautiful Macedon Ranges, they produce premium paddock eggs laid with love by healthy, free range chickens. 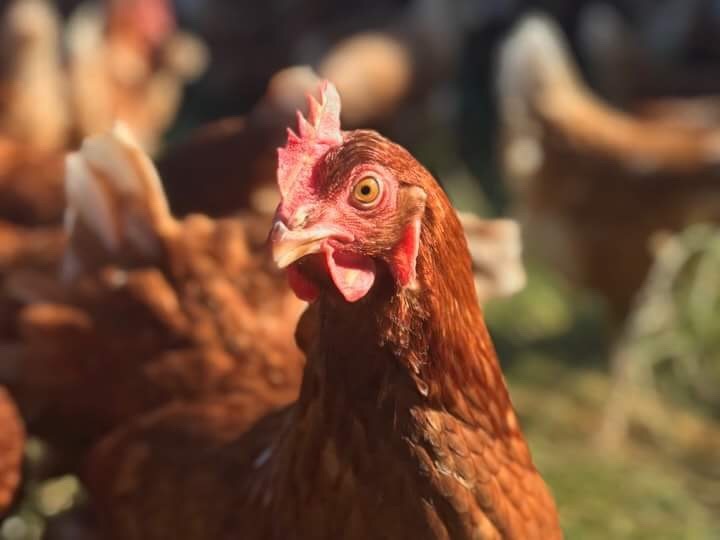 Previously vegetarians for ten years, Claire and Paul believe strongly in the welfare of animals and their hens live a true free range existence. Their ratio of chickens-to-land is only 600 chooks on ten acres, which is exceptional by industry free range standards. ‘Our chooks roam wild from sunrise to sunset, eating a diet of naturally foraged food supplemented by a healthy diet of grains,’ explains Claire. ‘We don’t use hormones and do cool things like feed our hens apple cider vinegar, garlic and probiotics to boost their immune systems’. When the sun goes down, The Good Life chooks toddle into their comfy mobile chook caravans to roost for the night, under the watchful eye of professional poultry guardian dog, Luca. These’ five-star’ chook caravans are moved regularly around the farm, providing fresh land to grub around in. Rotating the chook mobiles around the paddock is also part of the family’s regenerative farming approach, ensuring the land receives an equal portion of chicken love, with nutrient rich chook poo adding natural goodness back into the soil. ‘Paul and I take ethical farming seriously; it is our passion and underpins our entire approach to the business,’ enthuses Claire. ‘And we are driven by the big desire from our local community for healthy eggs, laid by chooks leading a truly good life’. The family’s premium paddock eggs can be purchased directly from their farm gate or by subscribing to a weekly delivery, The Good Life Direct, available from convenient pick up points across Central Victoria and Melbourne. Produce can also be purchased every Saturday from the Wesley Hill Markets in Chewton (near Castlemaine), as well as monthly farmers' markets in Castlemaine, Bendigo and Maldon. The Good Life Farm Co also produces small-batch, ethically-raised pork and honey on a seasonal, pre-order basis.